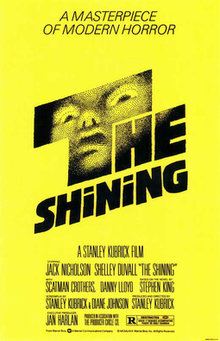 This was my first Kubrick and i loved it. Now i never read the source material so i cannot comment on the differences and how they impact the effectiveness of the narrative and themes, but the movie stands on its own very well. In essence this is a story about man being the scariest and most dangerous creature/monster of them all. We follow the writer jack torrence who gets a job as caretaker of an isolated hotel in the mountains who wants to use this atmosphere to write his next novel. He and his family move there over winter and soon weird things happen. Everyone knows the famous scene of the kid riding his tricycle through the lonely corridors of the Overlook Hotel and how creepy and atmoshperic this long take sequence is. The whole movie is incredibly effective at building this same tense and unsettling mood, the location they filmed at is obviously perfect but kubrick just knows how to film, when to cut, what angle to use. The performances are great, the music is awesome, it's basically the perfect horror film. so many of Kubrick's films feel like the technical accomplishments of a genius with very superficial treatment of the subject matter. Kubrick's form, motion, visual composition, and rhythm may be impressive, but the film hardly transcends story (it might have been better served if it had). Interesting i don't see the HAL death scene anything like this, there is no "sudden" thing at all here which comes out the left field, its mind gets disintegrated until the point of first version (where it sings). The psychedelic way of presenting the travel through space one looks cool (maybe not the cgi, but the part where they use fluids) and like something one could imagine distant places to be like and it also is thematically relevant considering that the change into a different state of consciousness is kinda the point there. I only included two kubrick's here but i have seen more at this point and i also highly disagree with "superficial treatment of the subject matter", it's just not spelt out and more open to interpretation, i don't see how it is any more superficial than other greats in these genres. Primer is one of my favourite films. I can see where you're coming from though, the budget forced them to make choices that give it a less movie like quality. Much of the dialogue is delivered deadpan as if you were just sitting in a room watching people talk. Red Viper have you seen Upstream Color (Carruth's other movie)? Its definitely worth a watch. It improves on Primer in some key areas - specifically the cinematography and the soundtrack. Nope but it is on my watchlist because i think carruth definitely showed potential, especially in the writing. I heard that it improves on the more technical filmmaking stuff, which is why i am somewhat excited about it, i am all for unique movies and i definitely think that he is the man for exactly that. Personally I loved Primer but kind of hated Upstream Color. Couldn't really put my finger on why, other than Upstream Color dripping pretension from its pores in a way I didn't feel from Primer. Definitely a worthwhile watch, though, especially from a technical and visual point of view. I thought Primer was gripping, confusing, and fun, a great example of truly lean filmmaking (sometimes too lean, off screen characters referred to in conversation elicit a few "who is that?" queries). no I haven't figured the whole thing out, but the looping and folding plot is enjoyable in its movements and twists and still spells virtually nothing out. Carruth is really adept at the bait and switch: just when you think you’re about to get an answer, you get another question. with Primer, it was the physics and logic that threw you first, then came the rush of psychological consequences. plot, then people. with Upstream Color, it’s all psychological consequences. no plot, just people. and they all seem traumatized, but the film is not without redemption. the power of Upstream Colour is in the gestures, the editing and the sound design. Did anyone watch "If Beale Street Could Talk"? I wanted to see it but it's gone from our theaters after being here for like a week. "again.. this is the long con... all of this money is going right into her pocket..."
i'll probably just stay at home and watch Batman Begins for the 500th time. if you liked "The Shining" i'd recommend Bryan De Palma's "Dressed To Kill" with Michael Caine and Angie Dickenson. I watched last year the "reboot" of Pokemon movies which was pretty good take on it and interesting. Last night i watched the second one in that series called Pokemon: The Power Of Us and it was good! The visuals in the reboots have been top notch and the animation is top quality i find which really helps sell it again. The story was pretty good as well in this specific movie. If you want a taste of nostalgia and have 90 minutes to spare then check it out! 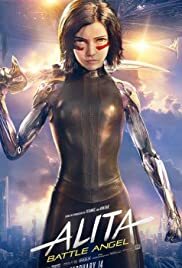 I saw an early screening of Alita: Battle Angel and I have to say I was pleasantly surprised at the quality of the film. The narrative was nothing spectacular but the pacing was solid, the CG animation was absolutely amazing, and the action was well-choreographed and really held up the entertainment quality of the film. Robert Rodriguez and his team obviously cared a lot about making this a watchable film, and they succeeded. I dare say this is the best live-action anime adaptation I have seen, and I hope he gets to make another one that he can go crazy on. Do you mean from Hollywood? The Rurouni Kenshin live actions were pretty good, as was the Gintama live-actions. This new aladdin movie trailer... Jafar's casting? Why is he not an old creepy guy? And Will Smiths genie CGI is already a meme. This is on The Rock as Scorpion King in the Mummy Returns level of bad CGI. They released a Hi-Res still of Genie and it looks much better. Why they aired this before it was ready, no clue. But if they get the CGI like the hi-res, it'll look amazing. And agreed on Jafar. I just saw Alita: Battle Angel. Surprisingly, I enjoyed it more than I thought I would. I am glad that the two posters have liked Alita so far as i genuinely think that film looks perfect and a great story even though all the press same to be so hated on it right now. There was an article in England stating how the whole film is based on "sexism" due to the eyes of Alita....not understanding how animation eyes are portrayed in Japan and that this is the inspiration behind it the manga series! Movie was really well done. And I think the eyes on Alita are not just a tribute but also a very clever way to avoid the "uncanny valley" effect full cyborgs might have. Also, screw all the Disney live-action remakes (in regards to Aladdin, Lion King, Dumbo and probably a gazillion more movies like that coming out soon). Edit: A review came out. Pretty spoiler-free. The Disney live-action remakes are just nostalgia baiting, safe releases that WILL make a lot of money. Artistically though, they will not be timeless since all something like the Lion Ling is is a show of how "realistic" they can make the animals and scenery look using modern CGI. Also the live-action versions of most of the characters are straight up ugly.